Bart Wide 5 - 15" x 12"
PitStopUSA.com - Bart Wide 5 - 15" x 12"
Bart Steel Wide 5 Modified Style Wheels are available in chrome or painted finish. Bart Wide 5 Lightweight Modified Wheel - Black - 15" x 12" - 2" Back Spacing - 19 lbs. 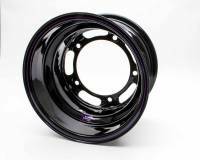 Bart Wide 5 Lightweight Modified Wheel - Black - 15" x 12" - 5" Back Spacing - 19 lbs. Bart Wide 5 Lightweight Modified Wheel - Black -15" x 12" - 4" Back Spacing - 19 lbs. More About Bart Wide 5 - 15" x 12"